it seems like monday's find me getting the house back in order after the weekend..
posting is always a somewhat random list of thoughts. and since honesty has always been my policy in blogging..
sunday morning i woke up bummed about the less than enthusiastic response my little bunny ears got across the web..
i envisioned scores of people loving them like i did..
sometimes i have to remind myself that in the end, i'm crafting for myself & family..
& that's all that matters..
i know i'm not alone in falling in love with one of my craft projects..
& then it seeming like no one else was really interested. it feels wonderful when someone likes something you put your heart in. it makes my whole day with each & every kind comment. 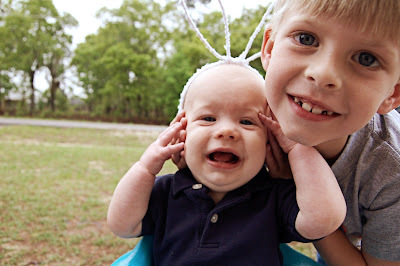 i needed to get over my self pity sunday morning..
because i LOVED the pictures of the babe in his bunny ears. & there were several kind people who stopped by to comment. so i decided in all of about 1 minute to make an easter version of my thumbprint hearts. grabbed the inks & my pen..
listened to the hubs grumble about waking up to be put to work. & in 15 minutes from the time i started it..
i was done & had it scanned & blogged. linked it up to a few parties..
and it EXPLODED across the web. & in the time shortly after that i had about 160 page views in 1 hour. since then it has slowly climbed in page views to be my #2 most viewed project. that's big in my small little corner of the web. not only that, but my subscriber number has climbed as well. all of this is not to toot my own horn..
or to throw myself a pity party..
i'm trying to be real about the ups & downs i go through..
because, honesty is the best policy. it feels good to hear something nice from someone. i know there are a GAZILLION talented women out there blogging about their families & their world. and i just wanted to say thank you. thank you for making this bloggers world a little brighter. thank you for taking YOUR time & doing something nice for me. i know that not everyone will always like what i make..
it was just one of those 'need a pick me up' kinda weeks, ya know? the kind of week where 3 out of 4 projects don't work out AT ALL. i'm trying to visit each subscribers blog & return replies to comments..
i've found some awesome new blogs i am so happy to add to my reading list! now i'm off to fold the laundry i threw over for a trip to michaels today. You know I am drawn to your blog simply because you are YOU! That's your greatest talent and asset. The thumbprint art is adorable, though! Im sorry i didnt comment, i loved your thumbprints and plan to do them with the kids as a fun easter project and gift to parents. I know exactly how you feel! I've had projects that I kind of expected to get a lot of comments on, and only got very few. It can be tough! awww... muffin! Your blog is adorable and always inspires me. Don't let the comments get you down! I completely understand. Whenever I use an idea or like what people have done, I comment (as I did on your ears earlier ;) but it is hard because you dont feel like you are getting the response that you were looking for. It is a reality check you have to do to remember that you are doing it for you and your family and in the end as long as your kids love it, thats all that matters.